Dogfight is a Vietnam-era story about a trio of Marines on the eve of their deployment. Sorta kinda like On the Town but with more, umm…malice, the three take part in an elaborate game whereby they find the ugliest girl they can and bring her to a party for judging. Victory goes to the most unattractive girl, and the Marine who brought her wins the pot. This plan goes topsy-turvy when our hero, Eddie Birdlace finds he is kinda sorta falling for the girl he brought, Rose Fenny, and begins to question the whole ritual. After a jam-packed evening of events, the two emerge changed…sorta kinda. Dogfight is a bittersweet story, and this dichotomous description proves just as apt for the current production playing at Cygnet Theatre as it does for the content of the story itself. Artistic Director Sean Murray directs a cast that is sometimes wonderful and sometimes understaged in a musical story that is sometimes wonderful and sometimes understated. It’s both bitter and sweet, but rarely at the same time. First of all, a dichotomy runs through the show’s very structure. Act I takes the audience on a terrific ride of musical sequences. It naturally paces itself, because so much of it is scored. Act II, on the other hand, introduces a number of scenes that suddenly slows down the action. The difference in pace between the two acts is palpable. It languishes mostly from too much sitting—restaurant, tattoo parlor, and bridge scenes, for example—as well as a self-indulgent tendency of many of the actors to deliver lines a little too profoundly, touch noses a little too broodingly, and court a little too tentatively. Individual performances also fall into this “bittersweet” dichotomy. 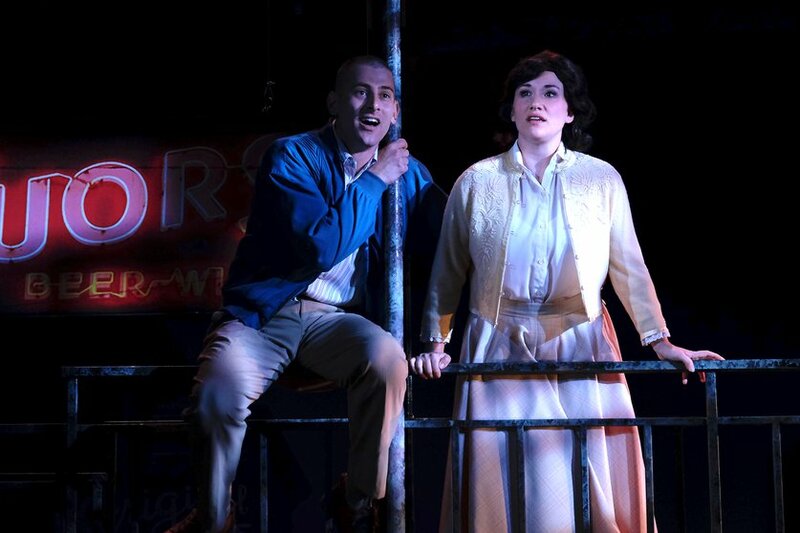 Caitie Grady sings the role of Rose beautifully; she has the best musical material in the show. “Nothing Short of Wonderful” and “Pretty Funny” are terrific. Some of Rose’s one-liners are real zingers, and Grady fires them against the Marines with precision. But there’s an inherent problem in casting this leading lady. Rose needs to be believably unattractive enough to be considered a contender for the Dogfight, but the role would be unsuited for a character actor. Or would it? There’s an unfortunate question that can pop up in this situation, one that probably came up at the casting table and one that certainly came up over post-show drinks: “Is Rose too pretty?” Back-handed compliments aside, Grady gives a fine performance. Our leading man poses another problem that is—again—partly the show’s fault. Patrick Osteen brings everything that an audience could want in its hero, Eddie Birdlace. Youthful exuberance: check. Wailin’ vocals: check. Smoldering good looks: check. Unfortunately, Eddie Birdlace is a jerk. He’s a conflicted jerk, but a jerk. Even though the audience watches him (sorta kinda) grapple with the morality of this terrible contest, by the end of Act I, Rose gives him a tongue-lashing we’re grateful to watch him receive. In a strange way, things wrap up rather tidily at the end of Act I. The only reason we care about Eddie enough to come back and see more is because Act II is printed in the program and because we’ve all seen a musical before and know this is not how musicals usually end. In the way of supporting roles, Sarah Errington shines as Marcy. Errington gets the title song, and her belting rendition satisfies lovers of contemporary musical theatre. Alex Hoeffler and Scott Nickley play fellow marines Boland—the hardened, street-wise one—and Bernstein—the naive, fresh-faced one—respectively. They’re playing to archetypes here with varying success. Hoeffler’s detached Boland plays more like a wooden soldier, while Nickley’s frantic Bernstein is more endearing. Rounding out the cast is a variety of Cygnet veterans and newcomers. 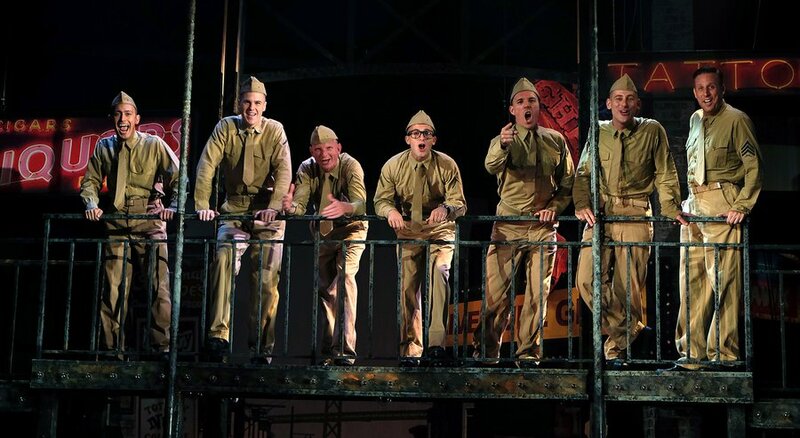 Winner of the Lucille Lortel Award for Outstanding Musical in 2013, Dogfight also received nominations for Drama Desk, Drama League, and Outer Critics Circle Awards. Productions of Dogfight are going up all over the West Coast and the Midwest including a slew of universities. This spring brought first productions to Sydney and Amsterdam. 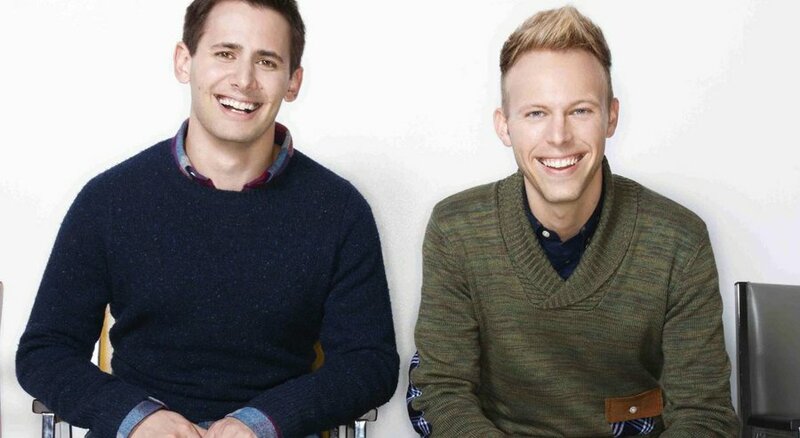 Composer/lyricists Benj Pasek and Justin Paul—like their show—are enjoying some popularity at the moment. Their new show Dear Evan Hansen is running now at Arena Stage. Musical Director Terry O’Donnell conducts a fine chamber orchestra; both solo and ensemble vocals are quite nice throughout. David Brannen choreographed the macho-Marine movement sequences. Sean Fanning’s set is outstanding. Cygnet’s production runs through August 23 at Old Town Theatre. Feminists should probably avoid Dogfight; then again, feminists looking for some fresh meat would find a feast here.